Bring a fun look and moving water to the edge of your pond using this Beckett Goldfish Pond Spitter. The extended eyes and open lips of this fish figure lend a whimsical look to your garden, while its upright fins and curved tail evoke movement. Realistic, individual scale shapes along the body add fantastic detail to the fish, while its mottled brown color and verdigris highlights reflect tones found in your water. A barbed fitting on one side of the fish accepts 3/8" or 1/2" tubing (not included), which, when connected to a submerged pump (not included), will easily push water through the statue and allow it to arch back into your pond. This not only adds a soothing sound and exciting look to your waterscape, it also helps the pond remain aerated. The flat base of the fish allows it to rest on a level surface next to your water garden, while its resin construction remains lovely and durable for many seasons. 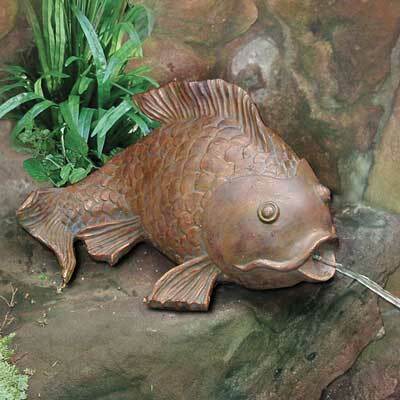 Add exciting aquatic life to the edge of your pond with this Goldfish Pond Spitter.